I'd not eaten Spanish food since I went to Barcelona last April and honestly I was desperate to get my fill of some tasty Paella. I've not found many places in Birmingham that specialise in Spanish food but I did know of at least one; Tapas Revolution. Me and Sean had walked past Tapas Revolution a hundred times coming and going in Grand Central but we'd never really had the time to stop and eat there. We had tried the takeaway Chocolate Churros before and were pleasantly surprised so one Sunday we decided to grab a table and sit down for a proper meal. Now I will admit at this point that I had read the menu wrong and I thought I could order a full plate of Paella from the set menu. Turns out you can only order a small Tapas sized bowl, who would have thought? Disappointed but determined to eat something other than a burger for once we ordered the cheaper set menu for two people. For £20 we got one Pan con alioli, one Croquetas de jamón, one Tortilla de patatas, one Chorizo a la sidra, and one Paella Valenciana. The 5 plates were easily enough for two people. As well as this we were given a small dish of pork belly to try, it was nice but it was a bit too rich for me. The food was pretty nice. 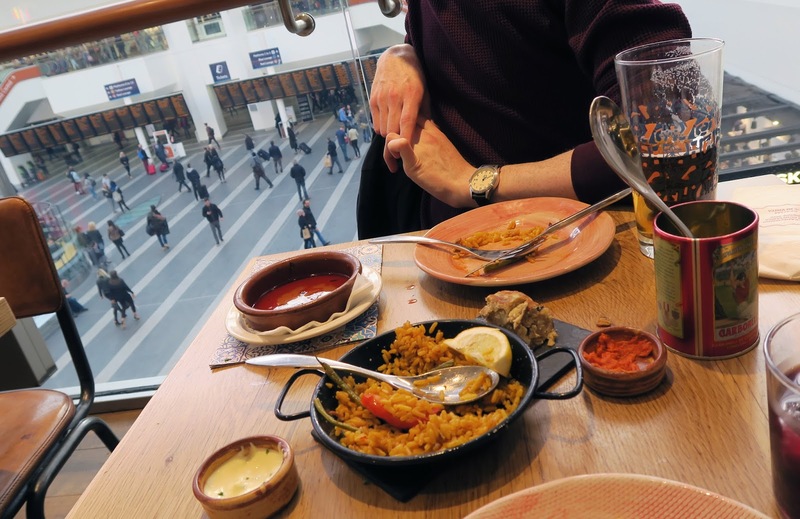 I was happy to finally have Paella, even if it was just a small bowl and Sean was happy to eat a plate of Chorizo Sausage as it was a bit too strong for me. I would say the tastiest dish was the Croquestas de Jamon which seemed to be fried battered potato balls athough I wouldn't bet my life on it. As well as our Tapas dishes we each had spanish drinks. I opted for a few glasses of grape juice which were honestly delicious and Sean chose a pint of Estrella. I thought the drinks were pretty pricey, a pint of draught beer coming in at £5.25, but I guess this isn't a place you'd eat at all that often. Overall I really enjoyed my meal. 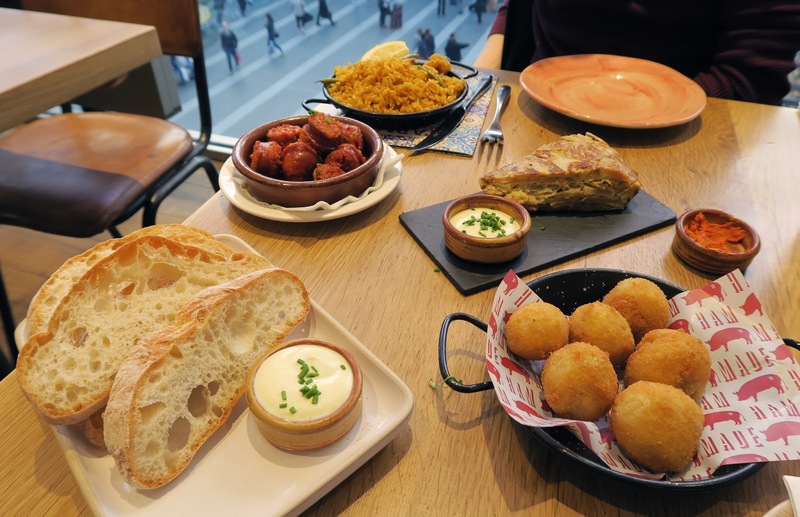 Although I'm probably not used to some of the strong tastes in Spanish food, I'd definitely like to try Tapas again as I love the idea of picking at a few bowls of food while you drink and chat away. I thought the service as Tapas Revolution was also pretty good, our server was lovely and if he hadn't have gone off shift I doubt we would have waited over 20 minutes to pay the bill. That was the only downside to the evening really, but apart from that I enjoyed my night. 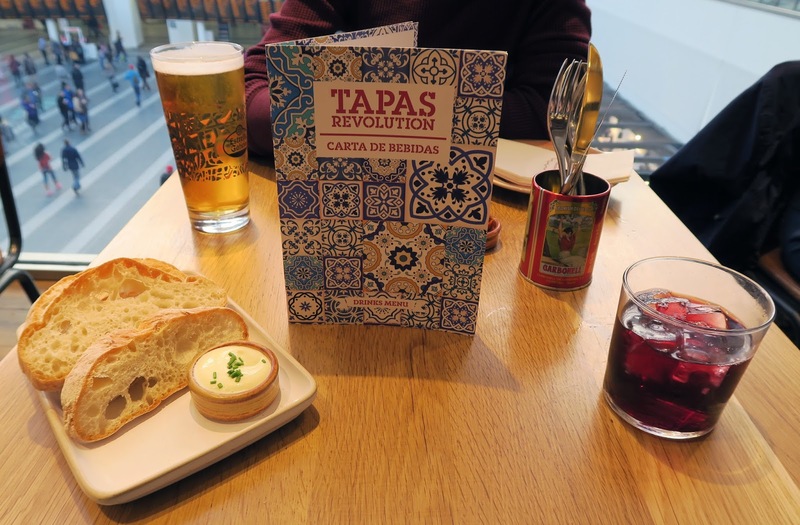 Have you ate at Tapas Revolution before?